After veering all over the place and never really settling into any kind of particular stride, Wagaya no Oinari-sama finally comes to a close. Given that slightly odd way in which the series has developed, it probably isn't surprising that the final episode was a bit of a rush and a jumble in all honesty, trying to tidy things up neatly while still leaving room for a second season. Indeed, speaking of tidying, the episode kicks off with a major New Year's clean-up operation championed by Noboru - Needless to say, it all goes a little awry when it comes to letting Kou and Kuu clean, and when the latter's sister (or brother? who knows) Gyokuyou turns up to see her sibling being ordered around, she decides to take action, giving Noboru and Tooru a "taste of their own medicine" by sealing them away in the same way that Kuu was by their family. 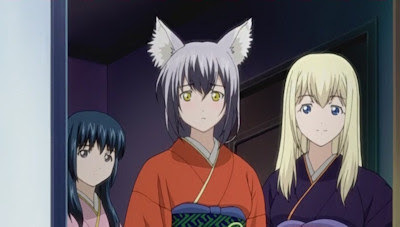 While Wagaya no Oinari-sama could hardly be called an outstanding series, it has retained a certain relaxed atmosphere to it that has at least made it largely watchable. It never really seemed to get the hang of mixing more serious story arcs with its more light-hearted side, and indeed as the series progressed it almost seemed to give up on creating much in the way of drama and tension, making way for more of the wonderful Sakura (easily the highlight of this series - have I mentioned that she should get her own show yet?) and some more random outings, but to be fair they actually brought a little charm and life to the series where previously there was none. I won't be waiting with bitten nails and bated breath for a second series of this show, but I have to confess that I probably would want to give it a look if such a thing were to emerge.